New Look to Google Docs! Last month, Google lets us preview their new revamped email interface with good results. The improvements in readability, functionality, and efficiency were evident right away. This week, the interface update is being applied to Google Docs (video). If you head over to your Docs Account, you should notice a “Try the New Look” link in the upper right corner of the screen. You’ll notice that the new look spreads things out a bit. If you’d prefer your document titles to be closer together, you can click “Document Settings” in the upper right corner and adjust “Row Height”. A few new keyboard shortcuts were added as well for those that wish to go “sans-mouse”. For example, you can now use your arrow keys to move up and down the items on your list. Once you’ve selected your item, type A to open the Actions menu and use the arrow keys to make a selection. Keyboard Shortcuts make navigation easy. Keyboard shortcuts are only available with the new interface, so be sure to click the “Try the New Look” link before using. Give it a try and let us know what you think! 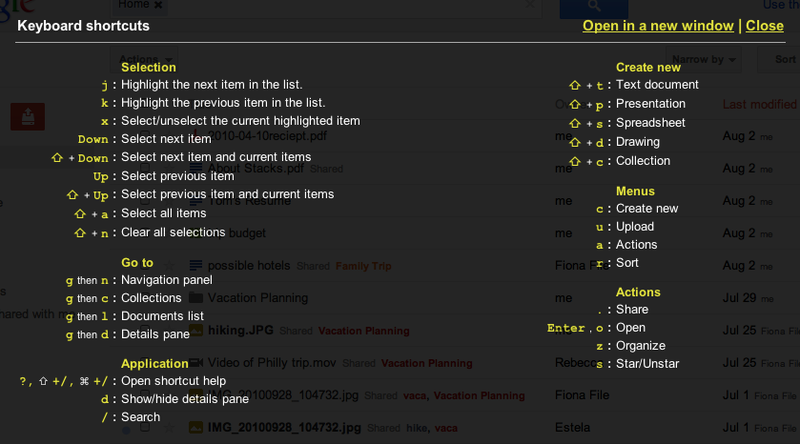 Previous Previous post: New Gmail Feature – Preview Pane!